On View January 8 – January 25, 2018. 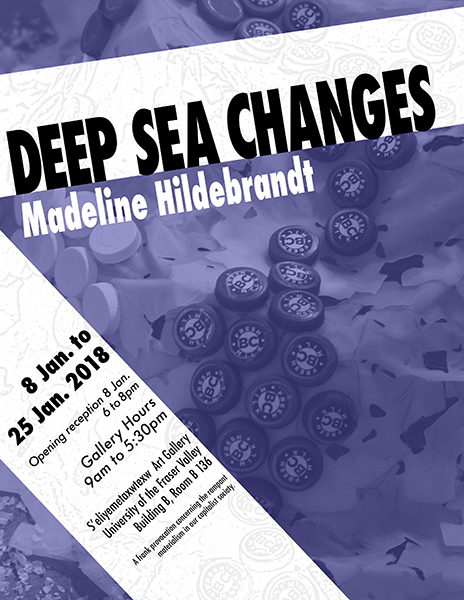 Deep Sea Changes is an installation depicting an undersea environment made from a variety of plastics gathered from my everyday life. Plastics are being used to represent this environment because of deep environmental concerns for the current and future state of the oceans that are being continually polluted by plastic and other debris on a daily basis. The accumulation of plastic debris in the ocean is so severe that it permeates every aspect of marine life. Deep Sea Changes provokes concern for the wasteful materialism that runs rampant in our capitalist society. On View at the S’eliyemetaxwtexw Art Gallery, Building B, B136, Abbotsford Campus, UFV.